Mike Check as a Radio Correspondent! John Thomas and BM Punk call in! JR is still angry! BirdTrolla! Koko FanFiction Theater with a horny Frankie! Another Round in Year 4 of the Co-Hosss Contest! (0 for 2) Morris Day and the Time live! 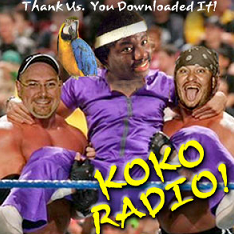 All this and the Piledriver song, right here on the most exciting episode of Koko Radio ever!! !